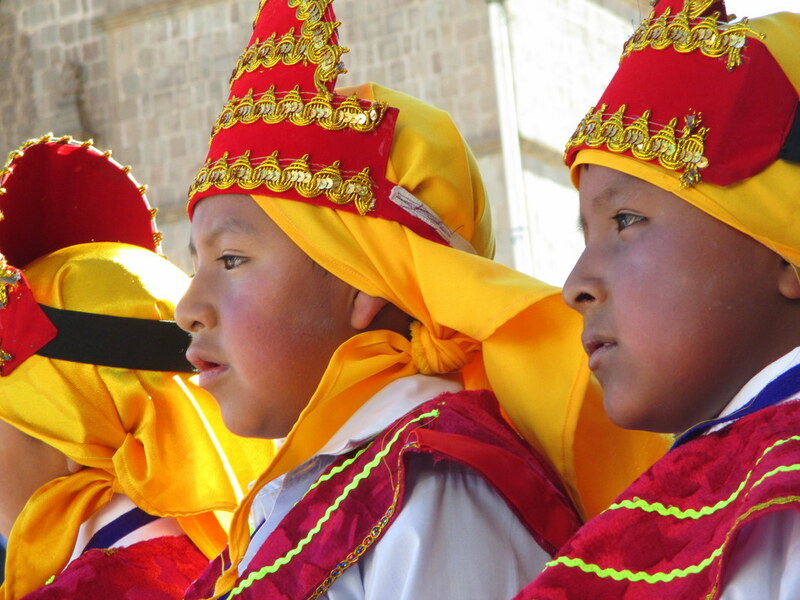 November 5th, Puno Day, the main local festival. When I travel I tend to forget the dates, days of the weeks and time (I’m in and out of time zones all the time too) and even years sometimes... so I quickly peeked at my phone: November 4th. And I was located a 4-hour drive from this simple village next to the Titicaca at the Bolivian side of the border… I exchanged a look with my 2 French travel-fella’s and it was decided. Puno it is, let’s go to Peru. Upon our arrival we already heard the bells ringing... the jingling bells attached to the dancers’ feet making an ear-deafening noise. They were practicing for the day to come, promising a feast for the eyes ahead of us. In Holland guys don’t dance (at least, I wouldn’t call the awkward shaking of the arms and pelvis in order to hit on women in bars dancing). In Peru they do. And they’re not afraid of showing their femininity while at it. So in pink scarves, with loose hips and rhythmically moving butts they jumped and tripped down the streets of Puno, while still impressing the ladies. The Frenchies and I needed something more heavy to keep us going, so we found the first metal bar I ever saw in South America. However, metal? Although I was surprised to find a painting of my electric guitar divinity on the wall, some bubbling pop songs blasted out of the speakers. Time to give them some new playlist suggestions, and before I knew it the place filled itself with the delicious riffs of Arch Enemy, Cradle of Filth and Wintersun. After a few buckets of the best Pisco Sour of the continent (sorry Chile, Peru wins), the bar owner took us and two Chileans we met to a local disco that smelled like rotten eggs and wet dogs. Cumbia music blasted out of the speakers. Alright then, let’s shake it. After this pre-party we woke up for the real deal. Puno Day. I entered the plaza in front of the beautiful cathedral and joined the colourful masses. I had no idea where I was waiting for, but I already enjoyed the sight of the crowds... Traditional women dressed in rainbow-coloured clothing, braided hair full of decoration and those iconic high hats. Something incredible was about to happen, I felt it. I heard loud gunshots and saw cowboys enter the scene, after which flag-carriers marched the streets. ​This was the start of a traditional parade of music, dancing and folklore. 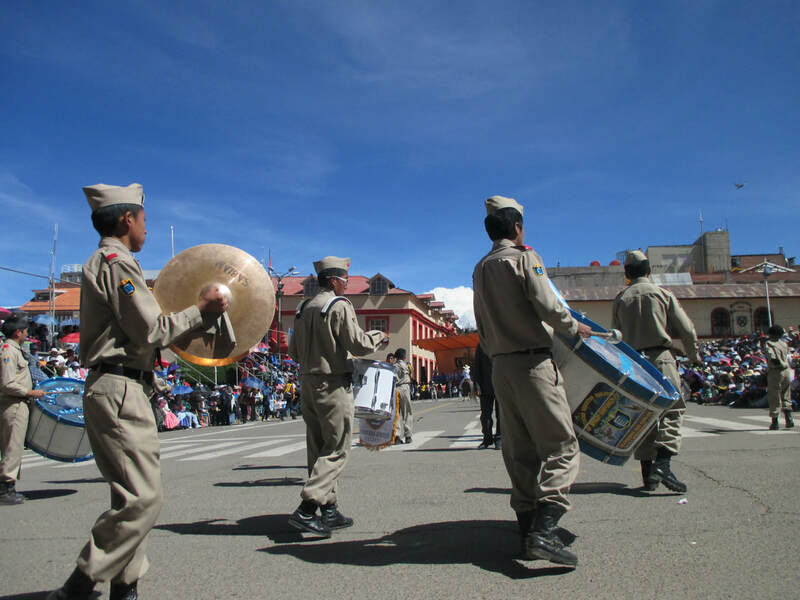 And in Puno they’re not easily satisfied, this parade lasted for almost eight hours straight and the amount of people participating in it probably equals the entire Peruvian population. What carnaval is for Rio, is Puno Day for Puno. While vendors sold their churros and chemical looking jelly, the dancers showed their gigantic bling-bling-bright costumes like proud struts. I couldn’t believe I was a part of this. Call me a lousy softy, but when I saw the adorable groups of children I even teared up a bit. - Where to next in Peru: Cusco, Machu Picchu, Huacachina, Huaraz, Cajamarca, Lima or Arequipa? ​- Just across the border: Copacabana and Isla del Sol!